ST. LOUIS (AP) — Missouri Gov. Eric Greitens is blaming his felony invasion of privacy indictment on a “reckless liberal prosecutor,” holding fast to the assertion that any case stemming from his admitted extramarital affair is politically driven. The only statewide Missouri official to be convicted, impeached and ousted from office was Democratic Secretary of State Judy Moriarty in 1994. She was convicted of a misdemeanor for backdating her son’s candidacy paperwork for a state House seat, then later impeached by the House and removed by the state Supreme Court. Gardner, 42, defeated three other Democrats in the August primary, aided by $200,000 in late donations from a national super PAC partly funded by liberal billionaire George Soros. The indictment has Greitens at a standstill. 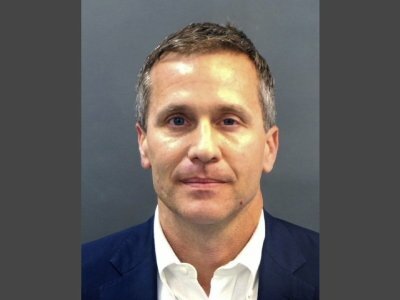 He canceled plans to go to Washington this weekend for a National Governors Association meeting, and the Republican Governors Association said Greitens “no longer intends to serve” on its executive committee. “I saw a flash through the blindfold and he said, ‘You’re never going to mention my name,’” she said. Lieb and Nelson reported from Jefferson City, Missouri. AP reporter John Hanna contributed from Topeka, Kansas.